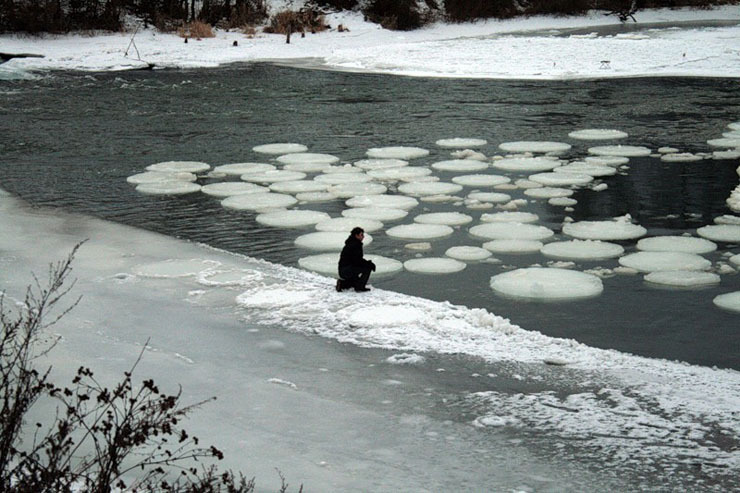 Recently a lot of strange round-ice formations have been met in Russia. People don’t know what causes ice to form first big ice circles and then ones of smaller size appear around the mother-formation. I never post on this blog 🙂 but visit regularly. I never understood why posted posted that comment 🙂 oh well. They look like neutron-bubbles from underground uranium and plutonium spills, maybe we can use them as giant energy pills. By the way, the math questions get tougher every day. 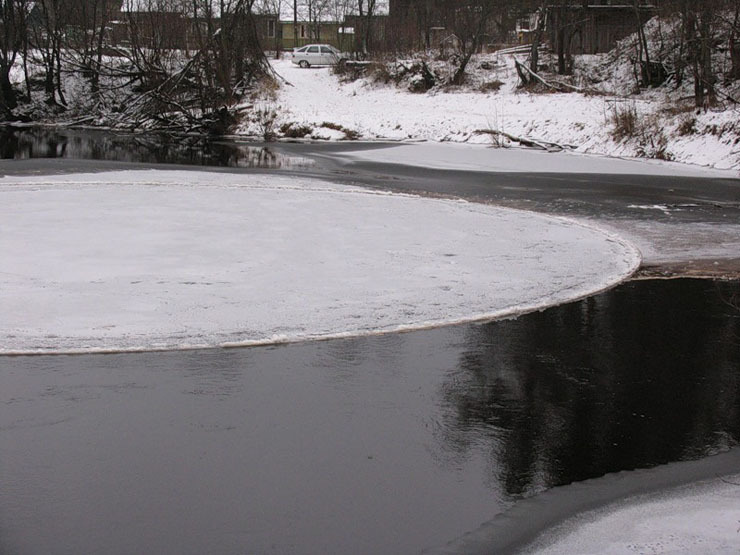 There is some kind of water current that spins the ice around slowly. 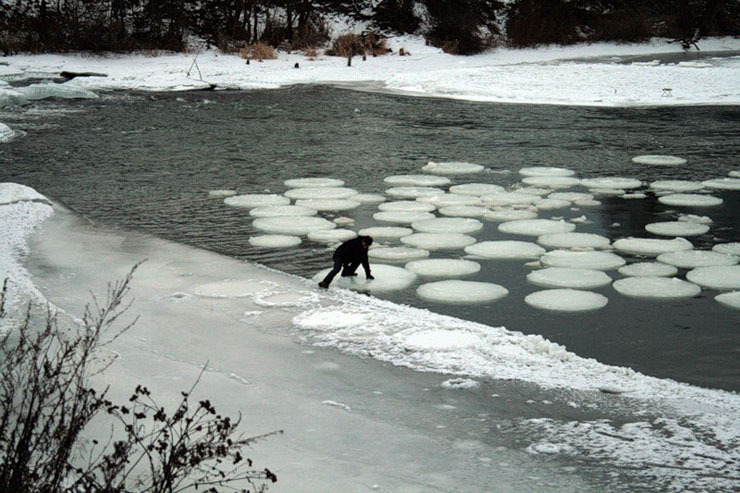 Friction then rouns the floating ice as they spin around and collide with each other. They copy round shape from USA. thanks for the link to Perestroika, I loved that game. must have been 12 years ago. 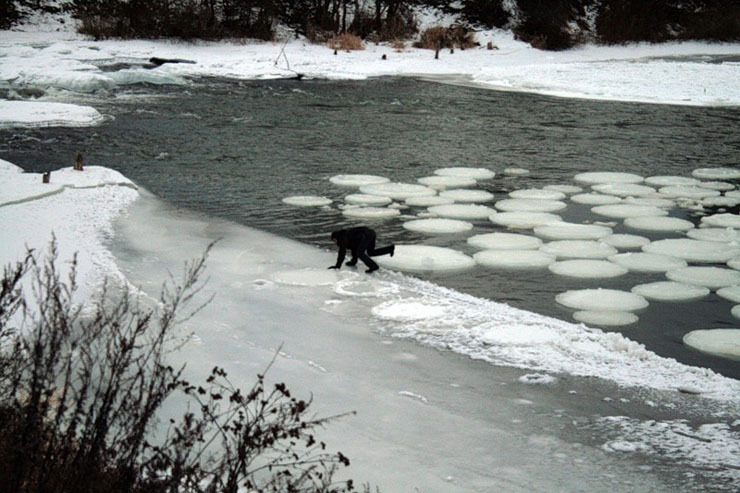 If there is an undercurrent bubbling upwards, then it can very well cause small circular ice chunks, especially if te water is almost below freezing point and the gases are mixed wit water. This is not water. It was a circle before freezing. This is no water. It was a circle before freezing. It is quite simple, the mass of the moving water contain energy that keeps it in a liquid state (excluding water itself may contain certain amount of salt, minerals, etc. ), the curent flowing in to the water reservoir under certain speed sudenly encounter stagnant water, this resolves in the large diametr whirl. 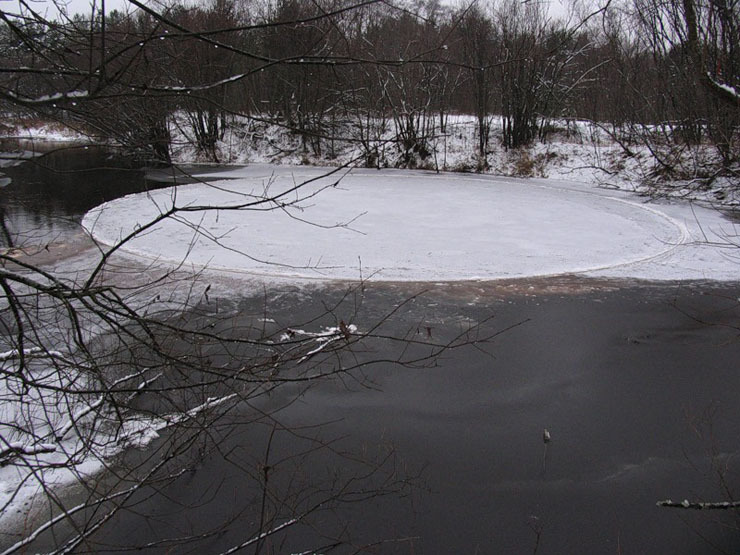 Since the particles in the center of the whirl maintain minimal speed it allows the water to be frozen, thanks to the molecular bonds the ice can start spreading in to the certain diametr when, of course, it will be unable to gain mass due to the higher energy transmited from the water curent. The smaller discs are the outcome of the similiar situation. When curent hit the big icy disc it will surrender some of it´s energy to the disc, some as mechanical energy(that keep´s disc rotating) some as heat, and rest of the energy keep mass moving around the disc and again creating several smaller whirls. Rest of the proces has been described above. I also bet my left nut that the disc would have a hyperboloid shape if cuted, that would be due to the singular tendency of the whirl. It´s no mystery, still nice phenomenom. 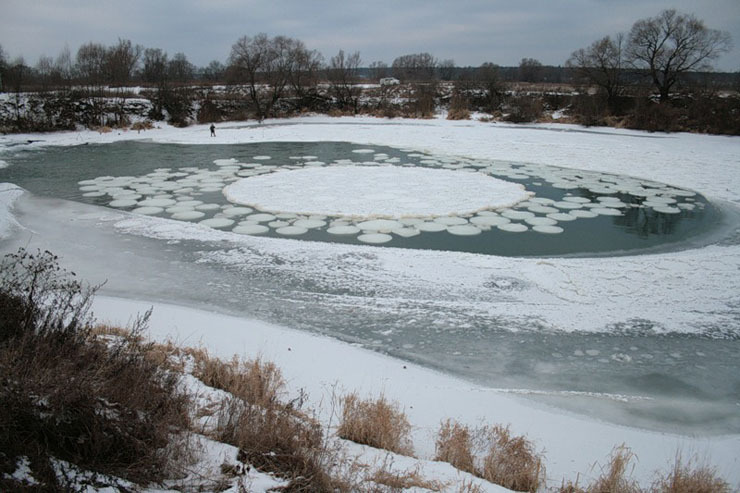 You can see in several of the photos where these circles are being cut from the ice and have not been “released” yet. Clearly some type of floating “art piece” was being created. The largest one looks like it was cut as well.. You can tell from the built up edges. 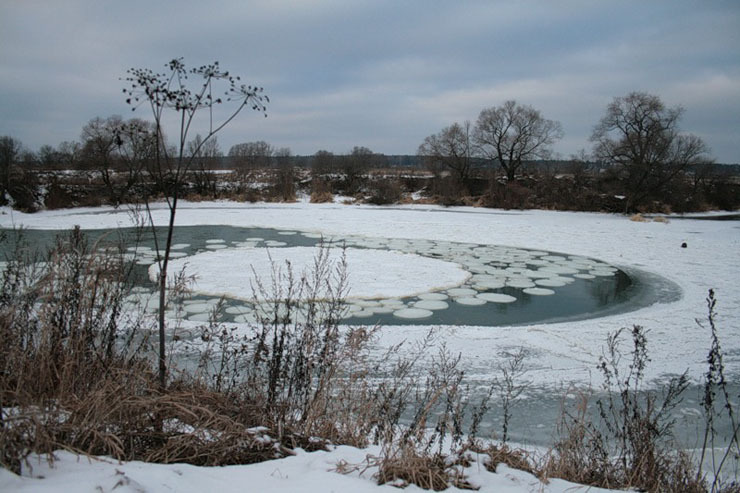 A winter lake version of “crop circles” heh heh..
BTW, i crave this blog as well as i crave Russia. Bah, filthy trick. Pictures 3,4 and 5 clearly show other circles formed ontop of the ice line, as if made the night previously or so with a simple round form. Is more like a performance art piece, like crop circles. It’s a natural phenomenon, no big mystery. We get it in Canada, too. Natural. 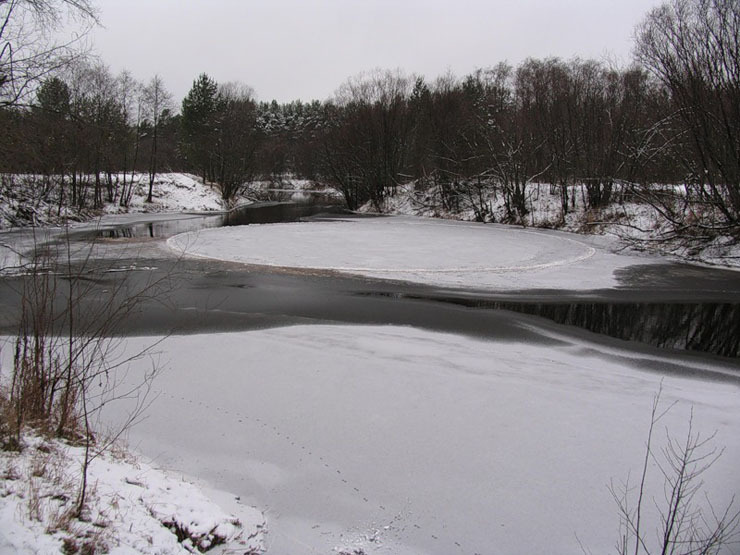 Any chunk of ice melting in water forms a rounded shape as it melts, because these have the lowest surface area. Try it yourself – cubic bits of ice in water become smooth and rounded after a little while. In streaming water somtimes ice forms at the botom en than comes up to the surfice like pancakes. In holland we call it (translated) groundice. This is formed caused by polutions in the water. Alot like water and oil mixtures, but backward. There is something in the water that much denser than the other substance. This will create different formations. Chemistry and Physics are fun. I could agree the current make a naturally occurring lathe of the liquid water and its surroundings, so it ‘machines’ the ice to that shape. But then it would be nobody’s fault, and who will believe that? Obviously George Bush and his minions have a time-machine, and this is evidence of it. Yeah–that’s the ticket! An eevulll Republican time-machine, smuggling SUVs back 10,000 years to start destroying thaa Planet. SUVs full of cigarettes and assault-weapons! We’re DOOMED. Best regards.